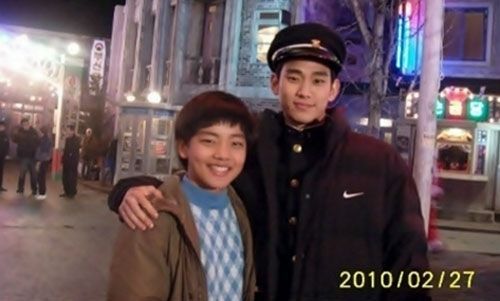 The photo of two “men of the moon,” Yeo Jin Gooo and Kim Soo Hyun, was exposed on the Internet in late February 2012. The small head of Kim Soo Hyun attracted people’s attention. In the photo, Yeo Jin Goo and Kim Soo Hyun stood together friendlily with Soo Hyun’s hand over the shoulder of Yeo Jin Goo, and both smiled. But the head of Kim Soo Hyun is obviously smaller than Yeo Jin Goo, attracted attention. Not only that, it can be seen from the photo that Yeo Jin Goo has grown by a lot in two years, amazing many netizens. Yeo Jin Goo and Kim Soo Hyun are starring in MBC drama series The Moon Embracing the Sun as young and adult Lee Hwon, and they also starred together in SBS drama series Giant two years ago, playing the childhood era for role for Lee Beom Soo and Park Sang Min respectively.